With optics and electronics that quickly and accurately range the target and the ability to send holdover data straight to compatible riflescopes, the Sig Sauer 7x25 KILO2200BDX Laser Rangefinder gives you a critical edge when it matters most. 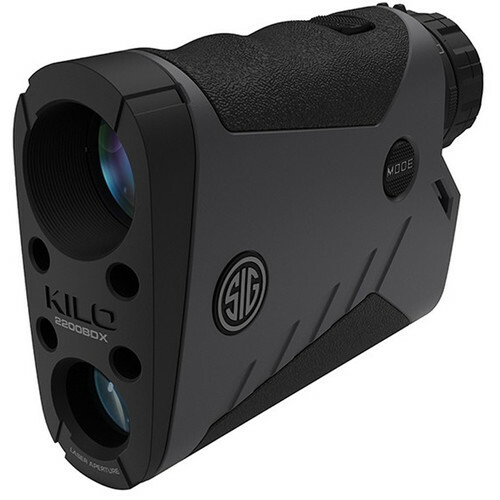 Its moderate magnification monocular gives you a good look at the target, then with the simple push of a button measures the distance out to as far as 3400 yards. Paired with the Sig Sauer SIERRA3BDX scope via Bluetooth and the SIG BDX app for iOS or Android, the rangefinder sends elevation and windage info directly to the scope's reticle—simply put the digital ballistic holdover dot on target, and fire. A dedicated processing engine provides a fast refresh rate for the laser, enabling four measurements per second so you'll have the most accurate range possible for moving targets or to confirm the range to a stationary subject. Complementing the rangefinder is an integrated inclinometer that measures the relative angle to the target. When the angle and range are combined, Sig's AMR ranging system adjusts the displayed range so you can compensate correctly for uphill or downhill shots, greatly improving your accuracy. The advanced LCD display clearly shows the ranging information in an uncluttered layout with a small, precise targeting circle. Designed for durability, the housing is made of a lightweight and durable magnesium with a binocular-style eyecup and diopter adjustment. Measuring 4.4 x 3.0" and weighing just 7.5 ounces, including the CR2 battery, the KILO2200BDX will be a valuable addition to your kit. Box Dimensions (LxWxH) 6.75 x 5.5 x 2.75"